Vibes from Lisbon are hotter than ever. The Portuguese capital is still quite cheap to visit and, at the same time, seems to have gained considerable traction in terms of being chic, cool and just fantastic. In recent years, large events like Web Summit have migrated to Lisbon, and even outside the touristy season, you will find first class events like Peixe Em Lisboa – the gourmet fish and flavours festival of the Portuguese capital. When visiting Lisbon, you will notice the contrasts between new and old. There is an astonishing amount of old buildings to be found; nowhere less than in the Alfama area of the oldest part of Lisbon with the St. Jorge Castle towering above. The castle and most of Alfama miraculously avoided destruction in the Lisbon earthquake of 1755 (museum at Praca de Commercio). In other areas of the capital, the architecture is like in the 1980’s and in some newer parts more like in 2010’s New York. 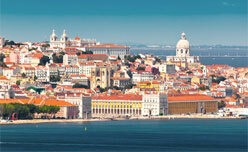 More information about reasons to visit Lisbon in Forbes Magazine. We might want to add: Cascais and Estoril south of the more famous Sintra; both of which are quaint old fishing villages turned into expat-hideaways.